Do you need tough socks that last? 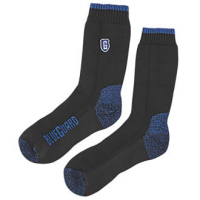 Blueguard anti-abrasion socks are tested by British Standards EN 13700:3002 to last 46 times longer than standard sports socks. If any holes do appear, a lifetime guarantee means we’ll send you another pair for free. Stop wasting money throwing away so many cheap work socks. Standard socks aren’t made to last. When worn every day at work, holes appear that can be uncomfortable for and damaging to your feet. This means you’ll constantly be having to throw away worn-out pairs of socks, wasting time and money. Blueguard tough socks are verified by British Standards EN 13770:3002 to last up to 925,000 cycles – 46 times longer than a standard sports sock. Long filament polymer bonds give your socks the strength needed to be worn day in, day out, without holes appearing. 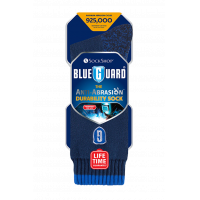 Even if holes are worn into your socks, a lifetime guarantee means Blueguard will send you another pair free of charge. 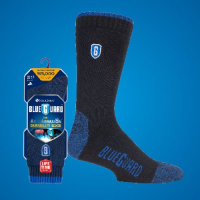 With comfort fit, a cotton rich body, reinforced toe seam, arch support, extended heel, and full cushion, Blueguard durable socks provide the comfort and support needed to work on your feet all day, every day. 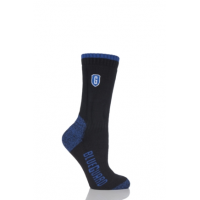 This makes them ideal workwear socks, or for any activity that can be harsh on your feet. Contact Blueguard now for more information. Long-lasting: Guaranteed to last a lifetime, if you wear a hole in your sock you can send it back to us for a replacement. Cost-effective: Blueguard socks last 46 times longer than a pair of standard sports socks, meaning that’s 46 pairs you save money on. That’s money you can spend on a holiday, instead. 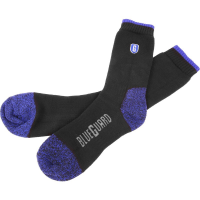 Comfortable: Just because they’re tough doesn’t mean Blueguard socks aren’t comfortable. Cotton-rich and fully-cushioned, the socks provide the comfort and support needed to work on your feet all day. Reassuring: Never worry about the comfort or durability of your work socks again. 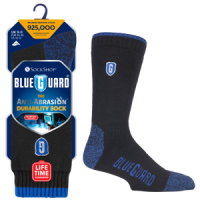 Blueguard socks are tested by British Standards EN 13770:3002 to offer the reassurance needed to wear your socks day in, day out, without worrying about the damage caused. 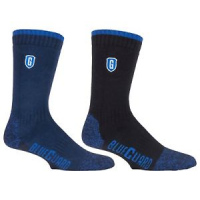 Wide range available: Available in a variety of sizes and colours, anyone can wear a pair of Blueguard tough socks.